Preheat oven to 220°C/420°F. Next, on a work surface sprinkled with flour, roll out pizza dough until flat. In a grease-free frying pan, toast pine nuts over medium-low heat, stirring often, for approx. 2 - 3 min. until golden brown and fragrant. Place dough on a lined baking tray. Spread crème fraîche evenly over dough. Sprinkle with pine nuts, feta, and onions. Grate Parmesan on top with a fine grater. Place in the oven and bake at 220°C/425°F for approx. 10 - 15 min. Remove pizza from oven. 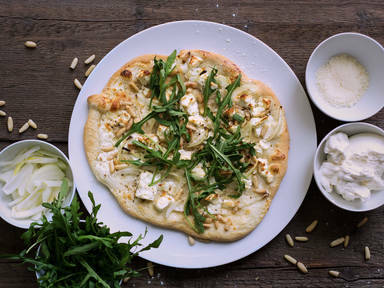 Season with black pepper and garnish generously with arugula. Enjoy!